In an increasingly competitive business environment, preserving and enriching human capital is a top priority of many companies across a wide range of industries. To retain talented, skilled and knowledgeable workers, employers provide tools and resources for their employees to be happy, healthy and productive, on and off the job. Cascade Centers Inc., a local family-owned business, is at the forefront in offering Employee Assistance Programs (EAPs), working with public agencies and privately held firms across the state and throughout the country. and Jerry Brown, founder, (sixth from left). An EAP is a counseling service for employees and their eligible dependents who may be experiencing personal or workplace problems, according to Anthony Brown, Senior Vice President of Sales and Marketing for Cascade Centers Inc. Services are provided by qualified professionals, and in some cases, referrals are made to professional providers in the community. In 1975, Cascade Centers was founded as a company that worked primarily with employers on drug and alcohol abuse policy development. Today, Cascade Centers Inc. is family-owned and operated by the husband-and-wife team of Jerry Brown and Gale Castillo, executive director of the Hispanic Metropolitan Chamber. 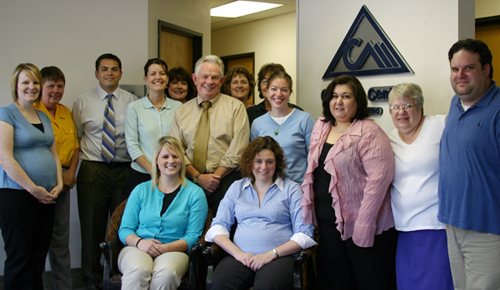 Cascade Centers has grown to 20 staff members, many of whom are based in the company’s Portland headquarters. Cascade Centers’ EAP consultants are professional licensed social workers and/or counselors who work with many school districts, counties, as well as industrial and manufacturing firms across Oregon. "The company started out offering alcohol and drug assistance programs, to help get employees back on track. Employers find that it’s cheaper to get their employees the help they need than to hire and train new people. That evolved to include stress management and depression, because these challenges also hinder people from being productive,” said Brown, who is responsible for business development and account management. Over the last few years, EAP offerings have evolved to include services that address work-life balance. “We offer help with marital and family issues, legal issues, financial advice, child and elder care, and even concierge service,” Brown said. Success of an EAP implementation often is measured by the degree of utilization among employees. Brown said what sets Cascade Centers apart from other EAP service providers is its “high-touch” approach. "Our goal is to help our (employer) groups get the maximum value out of our programs. Other larger organizations aren’t able to give attention and the detail that our groups demand. To make sure that our groups are using the program, we work hard at being a partner in figuring out the best fit for our clients,” said Brown. The crux of any employee assistance program is confidentiality. To measure utilization, employers have access to generic demographic information about program offerings. The identity of callers is kept strictly confidential. According to Brown, he enjoys all aspects of working with employer groups and designing EAP offerings tailored for specific employer needs. Managing Cascade Centers with his parents also has been a great experience, he said. "We’re one of the few companies that offer a wellness program as a core component of our EAP offerings," says Anthony Brown, Senior Vice President of Sales and Marketing.